Anyone who jumped out of a theater seat while watching the original Jurassic Park movie knows that velociraptors were formidable predators. Luckily for us they lived 75 to 71 million years ago, so the chances of you bumping into one except on Isla Nublar is low. But have you ever wondered how formidable those claws on their hind legs were? Well that’s exactly what Philip L. Manning of the University of Manchester and several of his colleagues did with the help of SIMULIA FEA software a few years ago. Read the report here. 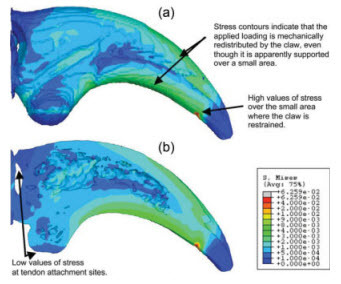 The starting point of the analysis was to generate the claw shape using scanned data from a fossilized claw of a velociraptor found in Mongolia. The material strength and density in an animal claw is not uniform so the team used analogous data from a modern eagle owl to model the material characteristics and strength of the original dinosaur digit. Once they had this they used SIMULIA to analyze the strength of the claw. The team’s analysis also demonstrated that velociraptors would have been able to support their full weight from their claws. In other words, climbing a tree to get away won’t help you. But at least, if the global trailer for the 2015 movie can be trusted, in Jurassic World the velociraptors are on our side, thank goodness! Guess we’ll find out today when the movie opens. If you want to learn more about this fascinating piece on bio engineering analysis you can read the full report here: http://onlinelibrary.wiley.com/doi/10.1002/ar.20986/pdf.